As a first time user, please contact your nearest Business Partner. Already a member? Download MyWOW App / or TWMMS to register. How to Login to TWMMS / My WOW App? What is the Service Provider for TONE WOW? How To Join TONE WOW? Contact your sponsor or find our Business Partner here. Purchase your TONE WOW SIM card and activate it. Where To Purchase TONE WOW Sim? Purchase from our Business Partner or visit TONE WOW HQ. For online request, you may email to orders@tonewow.net. What Starter SIM pack do TONE WOW offer? What are the differences between different TW sim packs? How long is the SIM validity & mobile number lifecycle? Validity as per top up denomination. i.e. : top up RM50 will get 50 days, then after validity you have 45 days grace period before it terminated. Where do I search for the nearest TW Business Partner in my area? If there is no Business Partner nearby, you may contact any of the Business Partner listed to assist. If you are a new user, you may register with the nearest Business Partner. If there is no Business Partner nearby, you may contact any of the Business Partner listed to assist. If you are an existing member, you can register using MyWOW Apps / TWMMS. I have registered a TONE WOW SIM card, what should I do next? Insert your sim card to your mobile phone and you will be activated. For Biz Pack, Your TWR30 TONE WOW reload plan will be activated within 30 minutes. If I didn’t activate, what will happen to my SIM card? SIM card will be terminated after 30 days from registration date. Does new registration come with free credit and freebies? According to MCMC guidelines, you are allowed to register up to five accounts (inclusive of Digi account). How do I update my information and account details? Please log in to My WOW Apps / TWMMS to update and make changes to your details. If I’m a new member at TONE WOW, can I register TE/TP account? If I’m a new member, can I register for Both TWE & TWP? No. You are not allowed. Can I change ownership on my account? How do I consolidate my multiple accounts? Please email to support@tonewow.net or click here. What should I do if there is any problems during registration? Please email to support@tonewow.net .We will get in touch with you within 24 hours. How long will the unregistered sim card expire? The SIM card validity is 3 years without registration. Are we allowed to exchange an expired Sim card that has not been activated? Am I able to reactivate my simcard and/or account if my account has expired? You are unable to reactivate the sim if the sim has expired. However, you may request for membership reactivation to retrieve your Member ID upon approval. To retrieve your ID, please email to support@tonewow.net (term & condition applies for Member ID retrieval). How to check credit balance? How to unsubscribe the plan? Choose 1 : TONE WOW PLAN. How to check last reload top up? How to check mobile number & expiry date? How to change language of USSD Menu? How to perform top up? You can perform top up through myWOW apps (please ensure your wowlet has sufficient funds) or click here or Walk in at any stores and purchase Digi reload. Can perform top up for other telco other than Digi in myWOW apps? What can I get when I reload TWR10? What can I get when I reload TWR30? What can I get when I reload TWR50? When I perform my reload will I get the plan automatically? Yes. Your TWR10, TWR30 & TWR50 plan will be automatically activated. You will not receive any credit. I have made the top up but I did not receive my plan, what should I do? If I reload TWR30 within the validity period, will it rollover? Yes. If you reload the same value of RM30. If I reload TWR30 and TWR50 within the validity period, will it rollover? No. Rollover has to be the same top up value. If I reload TWR30 and make a subscription via USSD of the same value will it rollover? Only subscription via the same method will rollover data. Subscribing via Top Up and then via USSD menu will forfeit data according to individual subscription expiry. Can I subscribe to the plan if I have enough credit? Yes. Dial *128# to subscribe manually. For TWS30 credit amount of RM 30 will be deducted and for TWS60, credit amount of RM 60 will be deducted. What Plans do TONE WOW offer? Roll Over Yes. Reload before expired. Max 3 times. If I don’t want to auto subscribe TWR 10 or TWR30 or TWR50, what should I do? You may top up more than RM30 or RM50. ie: RM35, RM55,RM60 or RM100. If I want to subscribe TWV30 , TWD50 or TWS60, what should I do? If I subscribe TWR50, then subscribe TWD50 within the validity period, will it rollover? No, rollover has to be the same package. i.e. : for TWR50 with TWR50 . If I want to subscribe TWS60, then subscribe TWV30 within the validity period, can I mix the plans? Yes, you can subscribe to multiple plans. 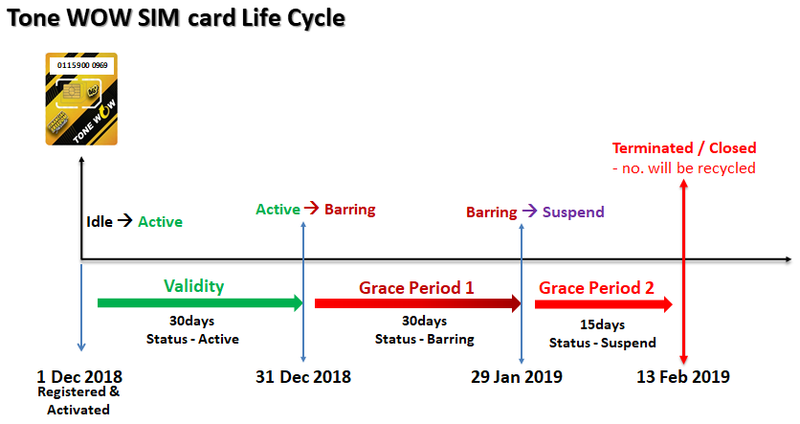 What is the Grace Period Policy? ALL TONE WOW subscriber can enjoy New Grace Period (as below description) by reload their TONE WOW mobile number with a minimum reload of RM5. What should I do before porting to TONE WOW? Your mobile number was registered under your ID/Passport. Mobile number is still active. Supplementary number(s) need to be ported together with Principal number. Credit Limit is not exceeded. How do I check my port in status? You can check your port in status via TWMMS / My WOW App. I still have credit balance in my previous account, will the credit balance be refunded once I port in? Your credit balance will be forfeited once your port-in is successful. Can I port in my existing Digi number into TONE WOW? No, Digi number is not allowed to be ported in. What should I do if my port-in submission has been pending for more than 48 hours? Kindly email to mnp@tonewow.net with your details. Will I receive any SMS notification regarding the status of my port-in request? Yes, you will receive SMS notifications notifying you on the status of your port-in request. I have an error port in message, what should I do? SP10 Wrong New NRIC Check NRIC details at original operator. Make corrections and Re-Submit MNP application. SP11 Wrong Old NRIC Wrong Check NRIC details at original operator. Make corrections and Re-Submit MNP application. SP12 Wrong Police/Military ID Check Police/Military ID details at original operator. Make corrections and Re-Submit MNP application. SP13 Wrong Passport Check Passport details at original operator. Make corrections and Re-Submit MNP application. SP51 Number still have contract with donor telco Cancel contract with donor telco and Re-submit MNP application. SP53 Overdue bills Settle all overdue bills with donor telco and Re-submit MNP application. SP54 MNP number not from donor telco Double confirmed with donor telco and Re-submit MNP. SP55 Number is no longer in service. Make sure the number is active before proceed with MNP. SP56 Number is a principal Line with supplementary Line(s) Principal line holder has to terminate all supplementary line with donor telco. SP57 Number is a Supplementary Line with a Principal Line Supplementary line holder has to register as Principal Line in order to MNP. SP58 Some or all number are not registered under customer name or main company Supplementary line holder has to register as Principal Line in order to MNP. SP59 Credit limit overdue Make sure credit limit is adhered. SP61 Disconnected/Suspended account Make sure the is active. SP71 One or all number did not reply confirmation SMS Highly advised to reply the SMS from donor telco within 5 - 30 mins upon receiving the confirmation SMS. SP72 one or all number replied 'NO' to confirmation SMS It is advised to reply 'YES' for confirmation SMS for port-in to TONE WOW purposes. The minimum requirement for commission is a minimum top up amount of RM 30 within the calendar month and subject to your Ranking in TONE WOW. Where Can I view my incentive? To view your statement, please log in to My WOW App / TWMMS. The statement will show your : App incentive, Monthly commission, Top up commission and Bonus (if any). If a TW member does not do the minimum top up requirement, is he/she entitle to the commission for that month? No. They are not entitled for the commission. Every transaction made will incur bank charges of RM3. Charges will not incur for Auto Top Up. Login to TWMMS to make changes. Go to Subscriber Care -> Bank Account Information. Request OTP (OTP will be sent to your registered phone number). Enter your OTP and click Submit. Enter Bank Account Info and click Continue. Note : The bank account holder name has to be the same as the member’s name. I do not have a bank account. Can I request for the bank information to be under a different person? Yes. You may request for a third-party account on TWMMS. Enter Bank Account Info and TICK third party request. Please attach the third party NRIC copy. Ensure that all information is correct. The third party request will be activated upon approval within 3 working days. What should I do if my Third Party request being rejected? Please ensure that you have filled all information and attach the copy of the third party NRIC. In accordance to the instruction from the Ministry of Finance based on Section 34(3)(a), Service Tax Act, 2018, as of 6th September 2018, the SST (Sales and Service Tax) will not be charged on the mobile prepaid service for Malaysian citizens. Non-Malaysians purchasing the mobile prepaid service will be subject to the 6% SST charge. HIWOW is for existing TE/TP member that would like to migrate to TONE WOW. You can purchase Lite Sim Pack for RM 10 and complete the registration using TWMMS or MyWOW App using your existing username & password. Can I HIWOW with my existing TE or TP mobile number? Yes, you can port in your existing TE or TP mobile number. What happens to my genealogy once I HIWOW? What happens to my incentive once I HIWOW? Your TE/TP incentive will remain unchanged and will continue with the new TONE WOW incentive. I am a Branch/SC/JC/PSC, what happens to my level once I HIWOW? What happens to my credit balance or points once I HIWOW and port in? If my downline make a TE/TP reload, will I be entitled for the commission after I HIWOW? Yes. You will still be entitled for the commission of your network. Can I convert back to TE/TP after HIWOW? If I already HIWOW a new number and I also have a TE/TP number, which number should I make minimum reload to be entitled for commission? You must make a minimum reload on either one number. If you split the reload, you will not receive the commission as it does not meet the minimum top up requirement for one account. If the member HIWOW and the port in fails, can they recruit TONE WOW members? No for TW, but still can do for TE/TP. What is a Lite Member? When you register RM 10 sim card, you will automatically be a Lite Member and you can enjoy the commission and benefits of TONE WOW. Are Lite members entitled to any incentives other than monthly incentives? Cumulative Total Monthly Personal Reload* of the recruited Lite Member in Month 1. When Lite Member upgrade to become a Biz Member, you as Biz Member, you will receive the upgrade incentive, however, if you are LITE member while your downline upgrade to Biz Member, you will lost your chance to receive the upgrade incentive. How do a Lite Member upgrade to Biz Member? Is there any time frame to upgrade to Biz Member? No. There is no time frame. How does a Lite member entitle for recruitment incentive (fast track)? A lite member entitled for recruitment incentive when you do a minimum monthly reload of RM30. As long as Downline perform reload RM30 or receive reload via other channels, Upline entitled to recruitment incentive. WOWcher is our loyalty program and we can earn from top up, new members’ registration, joining TONE WOW event and others. How to get the WOWCher? Where to redeem the WOWcher? Is there an expiry date for the WOWcher? When WOWcher are transferred from a member to another member, will the expiry date remain? Any maximum amount on transfer of WOWcher? Is WOWcher can be redeem with TONE WOW merchandise? What is the available merchandise for TONE WOW? Kindly visit our WOWStuff page to check out all available merchandise. If I would like to have my own merchandise, how do I get the approval? Kindly go through TONE WOW Product and Corporate Identity Guidelines (can be found here) before making any design. Please email the items to marcomm@tonewow.net to get the approval. Can I use Digi’s logo on the merchandise? The use of Digi’s logo is NOT ALLOWED on any merchandise and marketing materials. What should I do if I want to replace my TONE WOW sim card? You need to purchase TONE WOW SIM replacement at RM10 through our nearest Business Partners. How do I retrieve my TWMMS login password? Click at "Forgot password’’ link in our TWMMS. Type in your NRIC/Old IC/Passport/Army/Police and secret phrase. Select mobile number and click Reset. You will receive a temporary password via SMS which you can use to log-in and change to your new password. How do I reload my MyWOW App WOWlet? You can reload via a payment gateway through the app or you can walk in to HQ to perform the reload. I have made the reload to WOWlet but the amount has not been credited, what should I do? If the amount has not been credited within 24 hours, kindly email us the details and payment confirmation at support@tonewow.net . Please ensure you have sufficient credit balance to view the full USSD menu. I have successfully registered and port in but I did not receive my Member ID. This is a technical issue. Kindly contact support@tonewow.net with your details for assistance. I am unable to login to MyWOW Apps. Please refresh the app. If the problem still persist, kindly contact support@tonewow.net with your details for assistance. My commission has already achieved the target required, when will my rank be upgraded? I’m a Lite Member and I have upgraded to Biz. How do I qualify for JC? If you are a Biz Member because you have been auto promoted, you will need to achieve 150 to qualify for JC. The rank will be upgraded on the following month. My commission has already achieved the target required before effective memo, is I’m qualified for auto SC/PSC Promotion? As a Lite member TWE/TWP qualification is +400 to entitle for the incentive Trip. What if the Lite Member been auto promoted to JC? How about members that HIWOW after 15th October? If member HIWOW after 15th Oct 2019, example, HIWOW on 27th Nov 2019, then the HIWOW ranking will be the based on his HIWOW rank category to qualify for the trip. Example : HIWOW SC/PSC (TWP), target achievement = +RM1100. How many tickets will member receive if he has multiple Member ID? A member has one JC & one SC account, which rank should the member follow to qualify for the trip? Can they claim for both account? To qualify for the trip, the first ID that reach the target achievement will be qualified. Member is unable to claim for both ID if both are qualified. What commission achievement do I need for me qualify for the Pilgrimage Trip if I am a Biz Member? If you are a Biz Member, you will be auto upgraded to JC (TWE) by auto upgrade campaign, hence you will follow the JC rank to be qualified for the Pilgrimage Trip. Can I exchange it to cash? I have already claim the pilgrimage trip in 2018, can I request again? No, you may only claim the pilgrimage trip once. How do I make the booking for the pilgrimage trip? You are responsible to make your own booking for the trip.